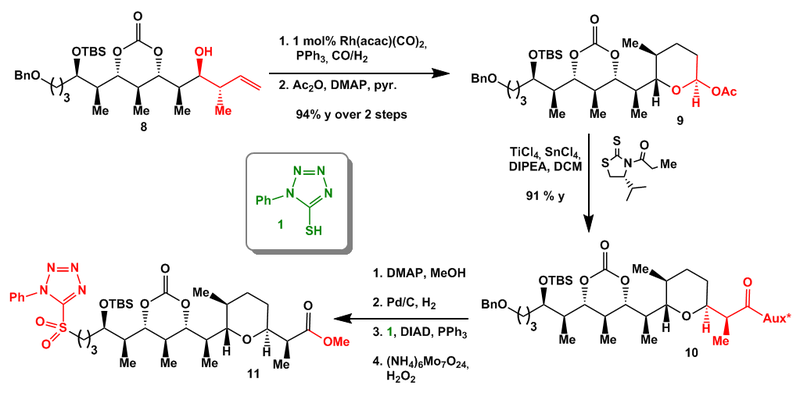 Recently I stumbled onto this excellent paper from the Reisman group. 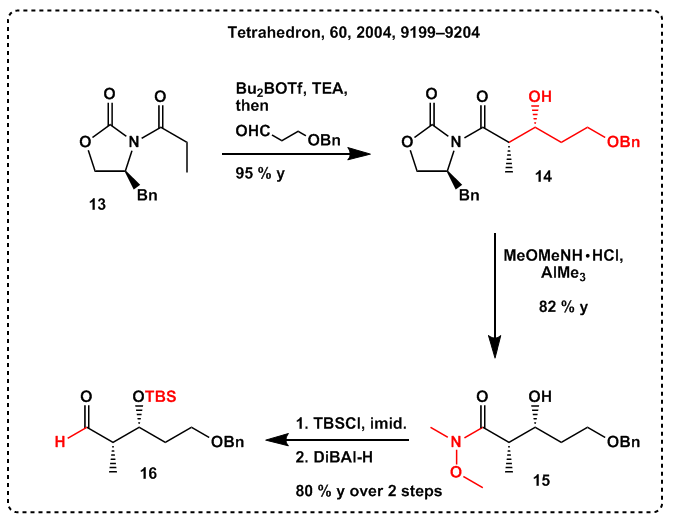 While reading the paper I wondered if I ever reviewed one of their total syntheses because of the very appealing tactics employed by the group. 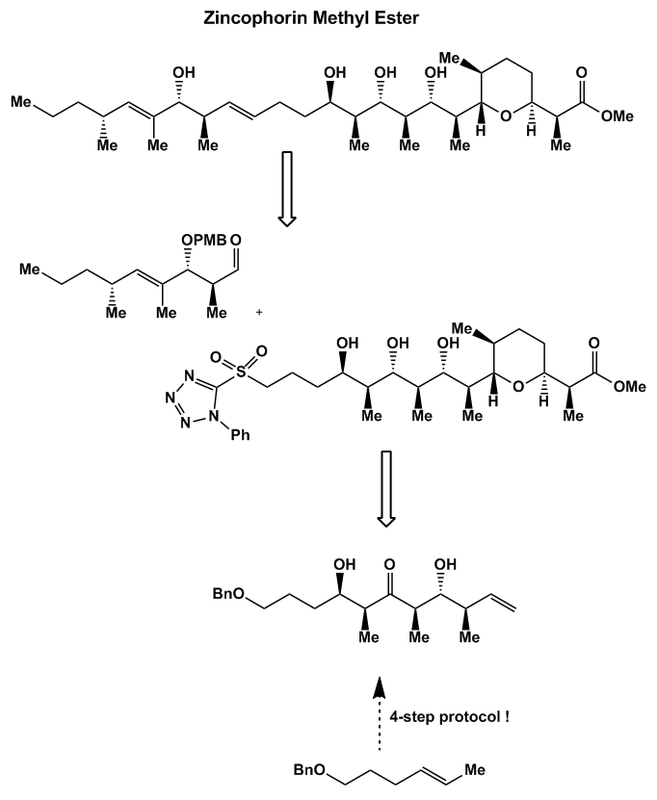 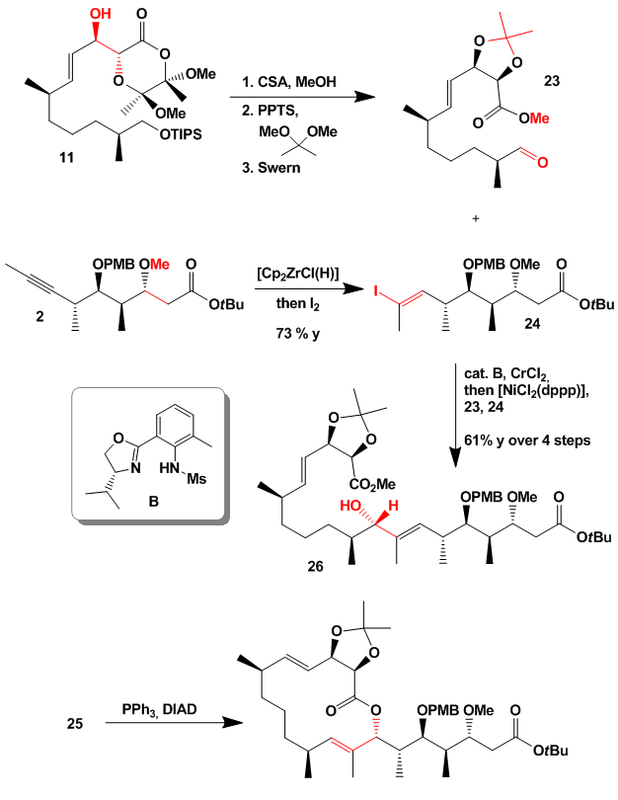 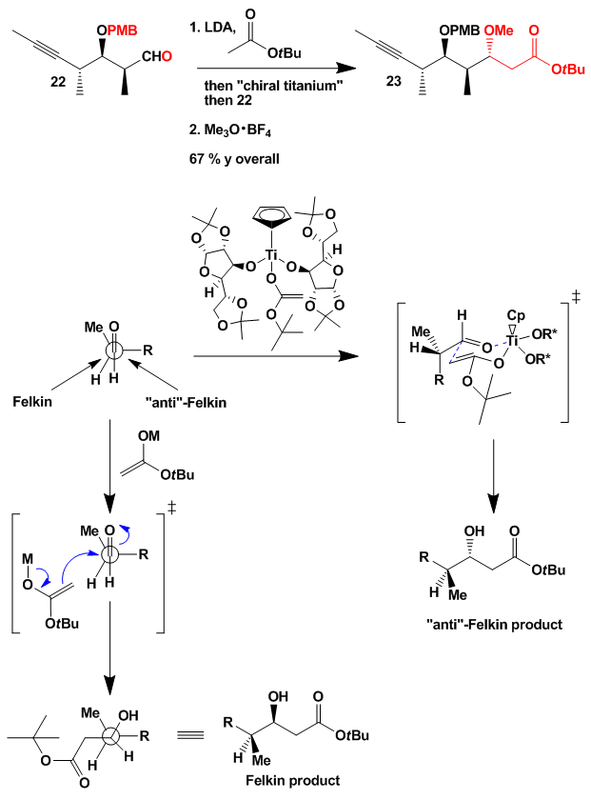 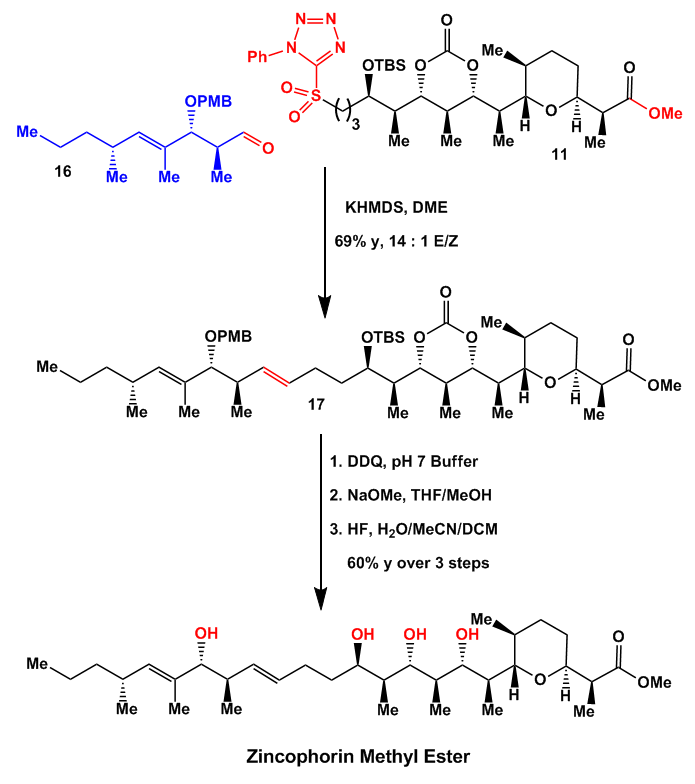 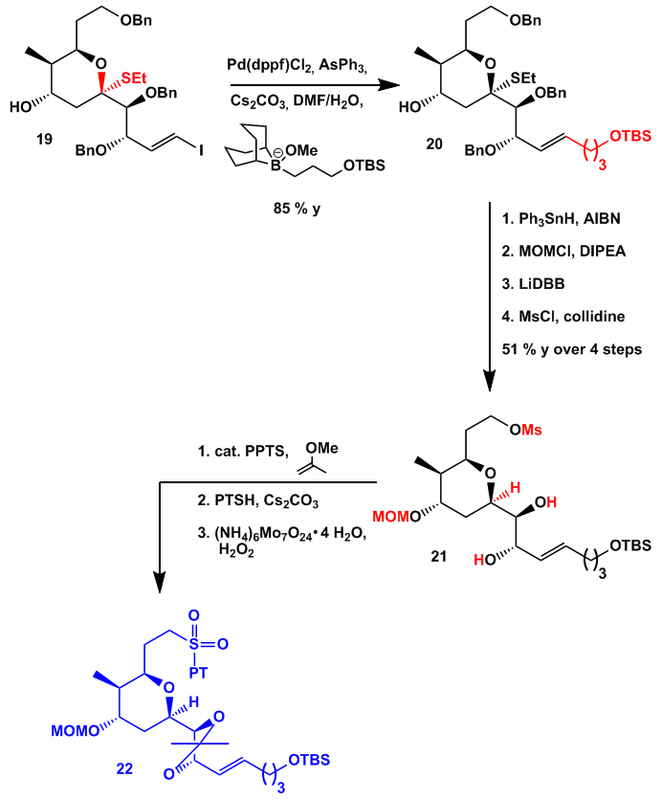 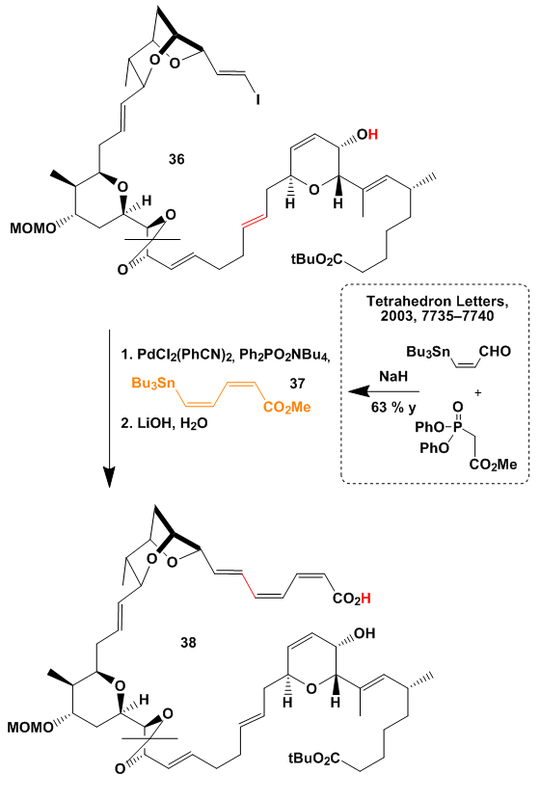 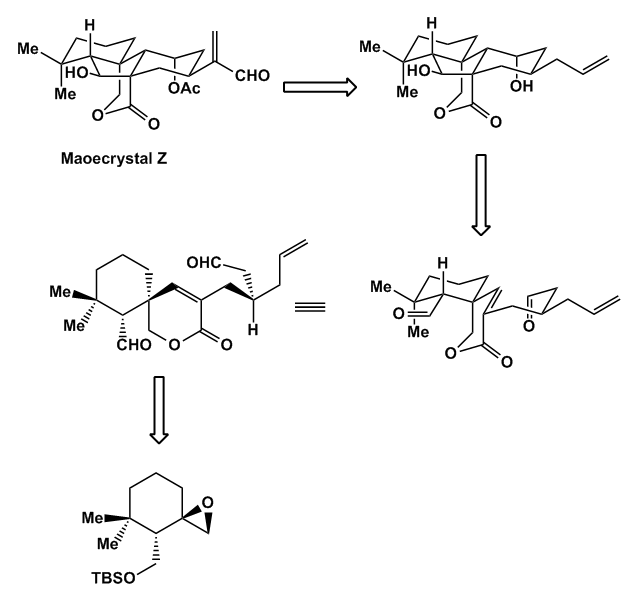 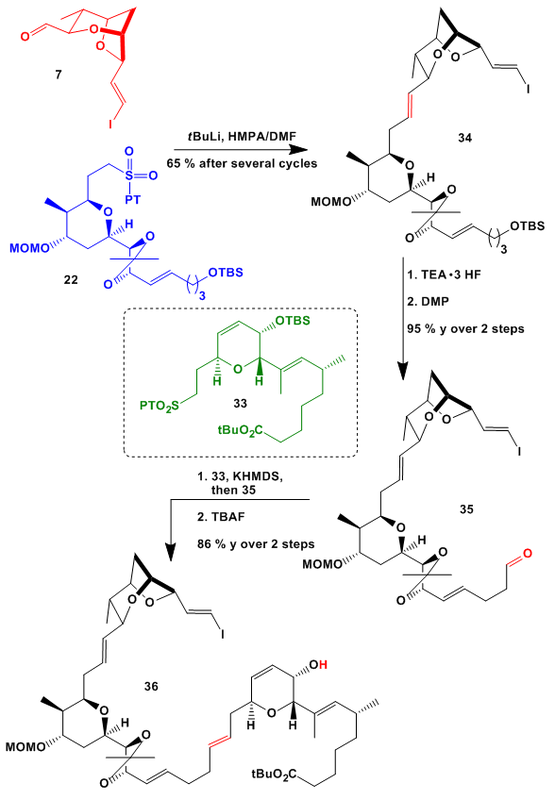 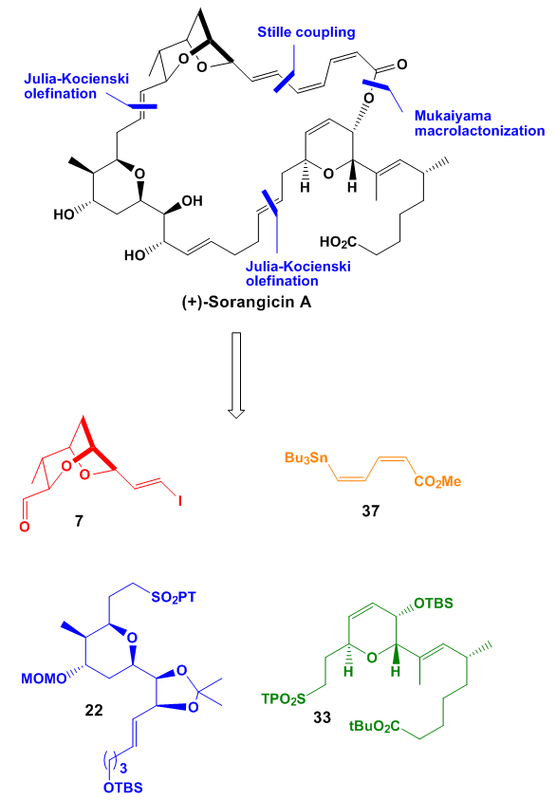 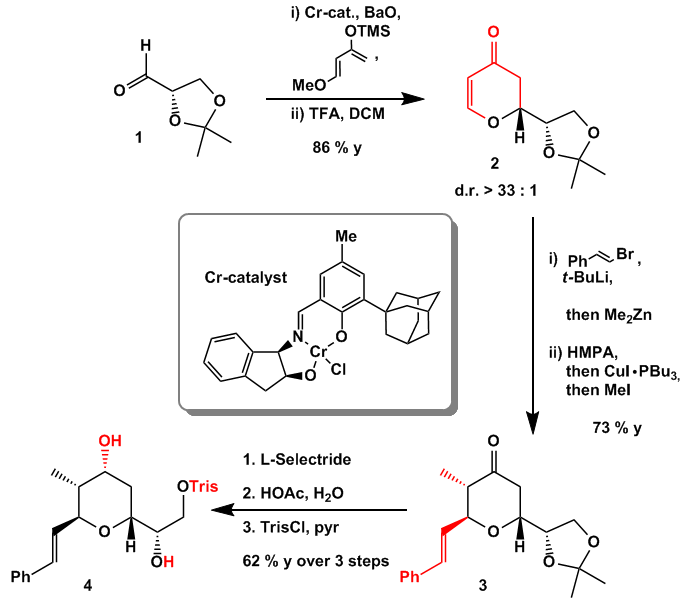 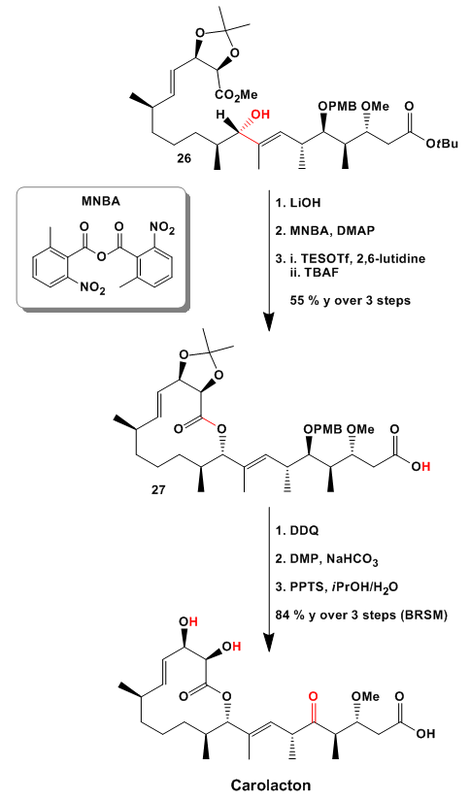 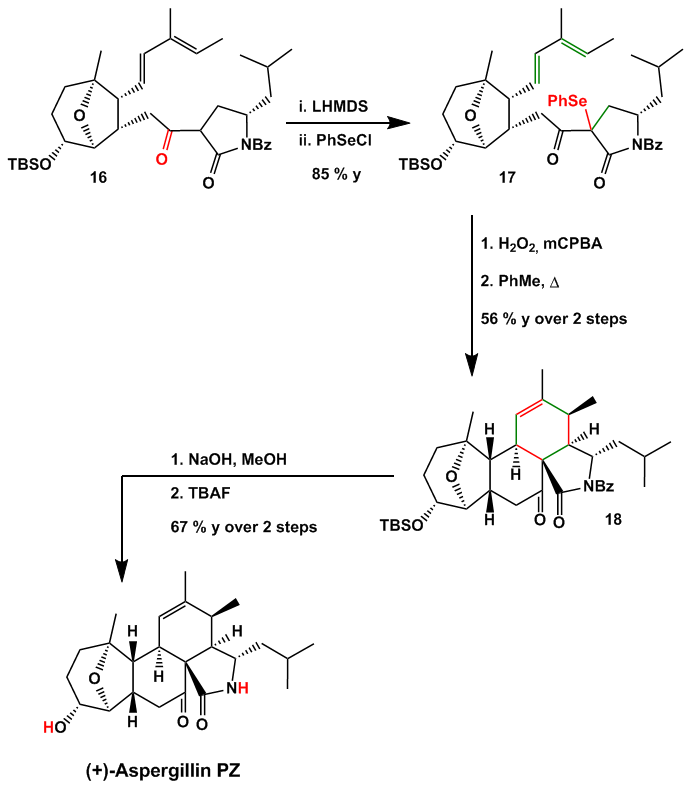 By checking my archive I found the review of salvileucalin B … Nevertheless here is another excellent piece of work from this young research group featuring the total synthesis of Maoecrystal Z. 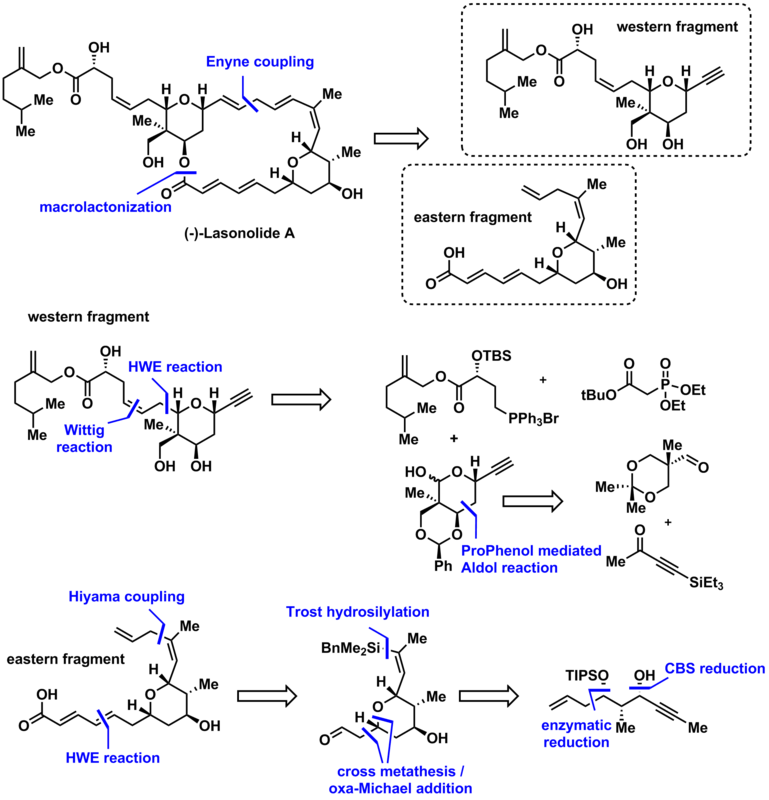 The retro is shown below. 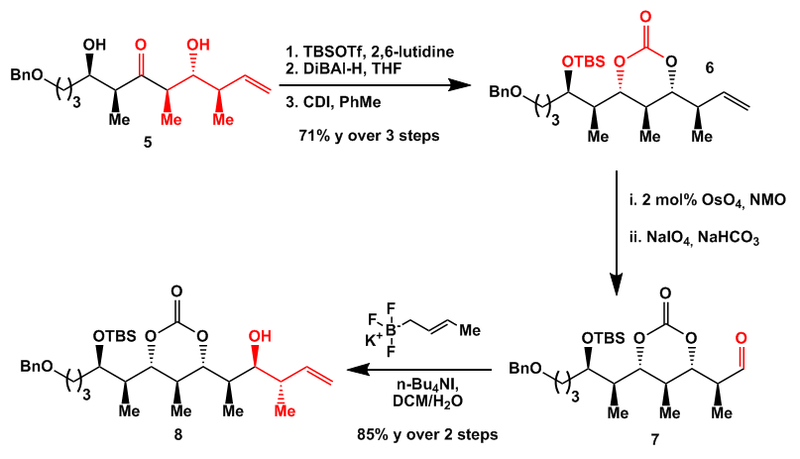 Some functional group manipulations led to a diol which was disconnected with respect to a radical cyclization cascade of the corresponing bisaldehyde. 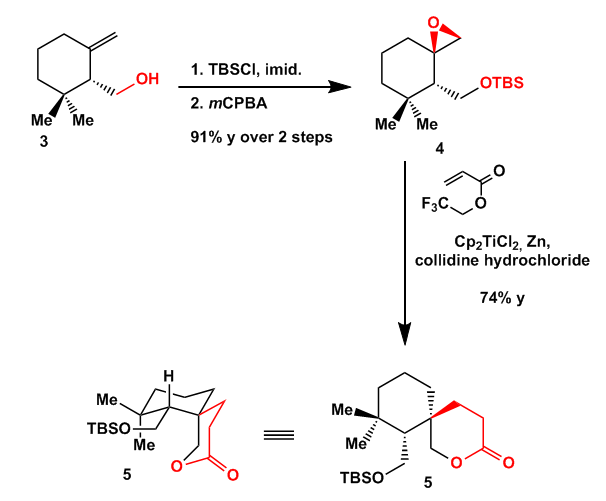 This in turn derived from a spirocyclic precursor which can easily be synthesized from a known cyclohexane derivative. 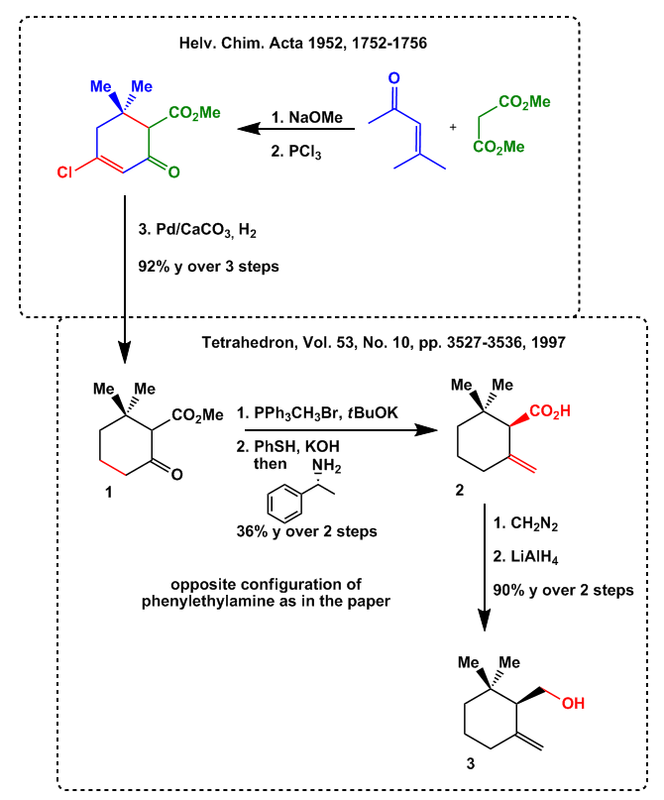 Though the paper starts from 3 the synthesis of this intermediate can be found in two older publications. 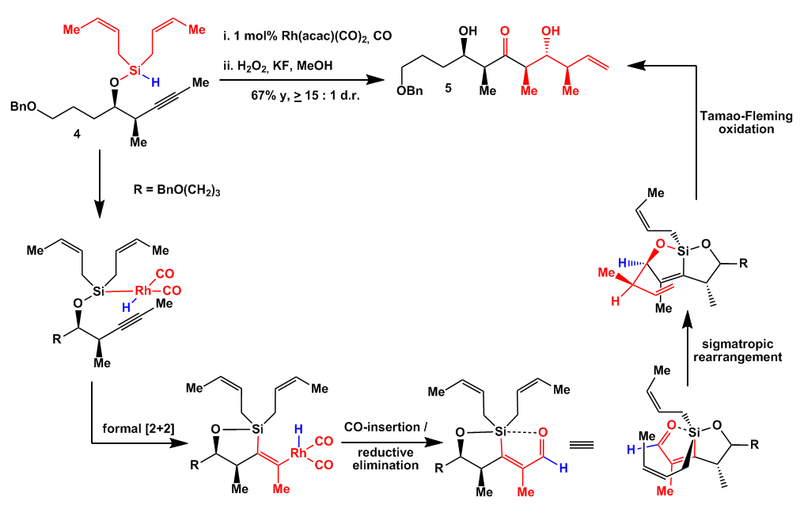 The synthesis begins with the condensation of methylmalonate and mesityl oxide followed by conversion of one of the resulting ketones into a vinyl chloride with PCl3 and reduction of this into cyclohexanone 1. 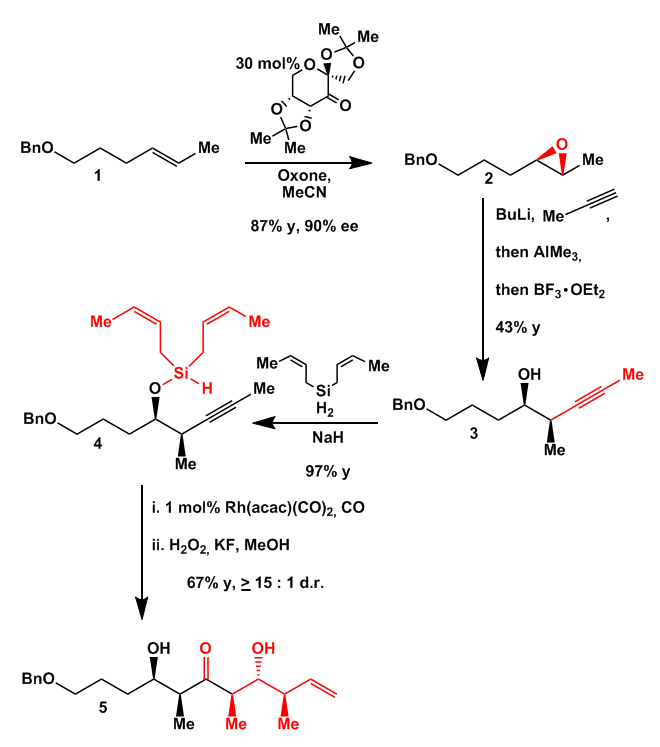 Wittig olefination, mild ester hydrolysis and resolution with (R)-phenylethylamine gave acid 2. 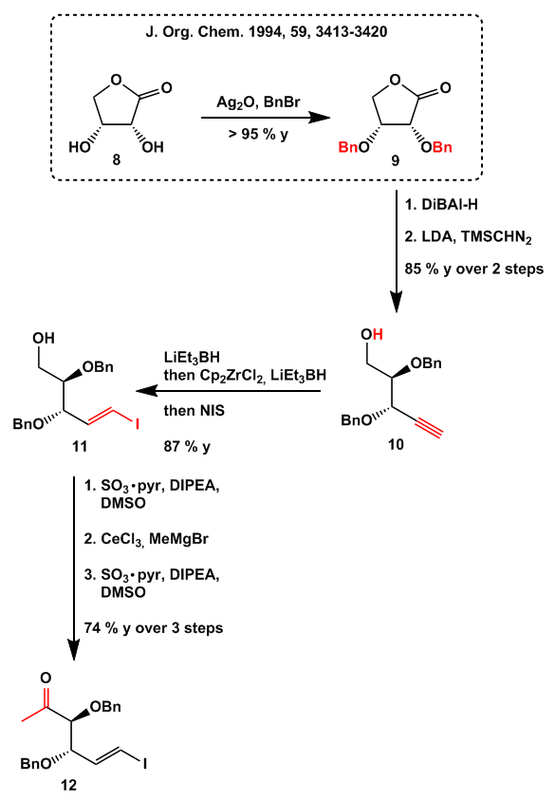 Esterification with diazomethane and reduction with LAH then gave (-)-γ-cyclogeraniol 3 in good overall yield. 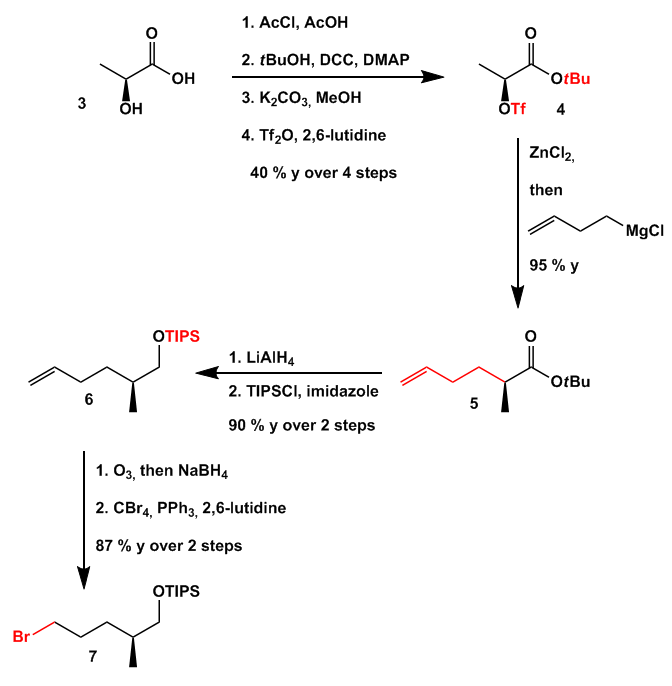 Going on with the synthesis the alcohol was silylated and the exo methylene group epoxidized with mCPBA. 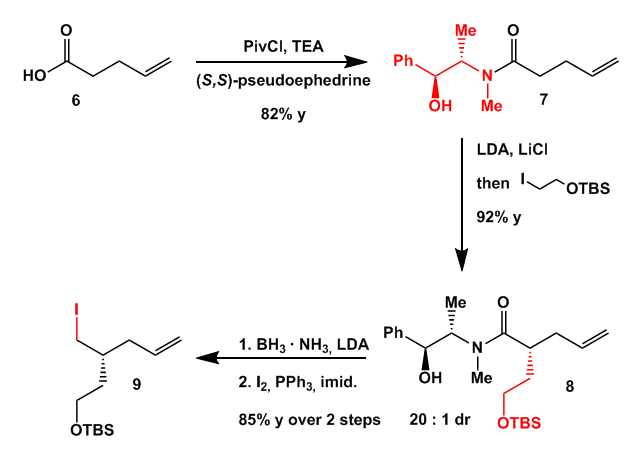 Now to the first key step of the synthesis: a nice lactone formation through a radical promoted cyclization employing a protocol devised by the Gansäuer group. 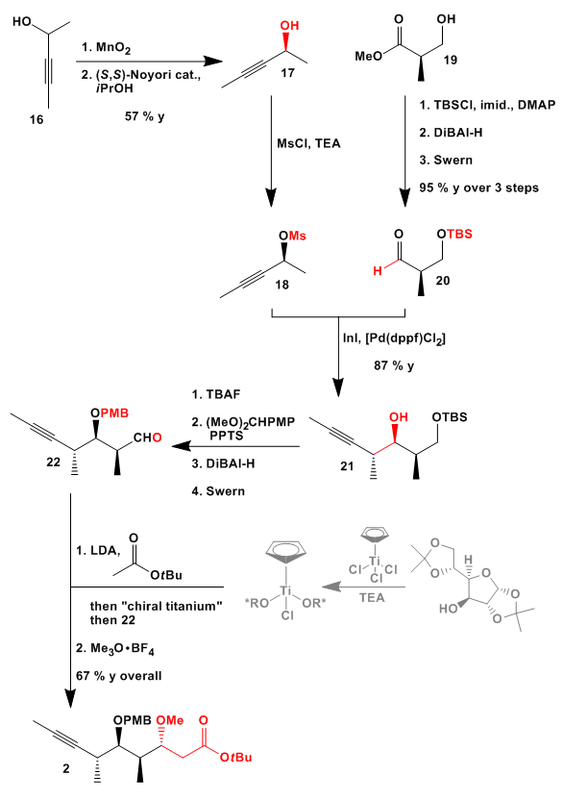 The mechanistic details are discussed at the end. 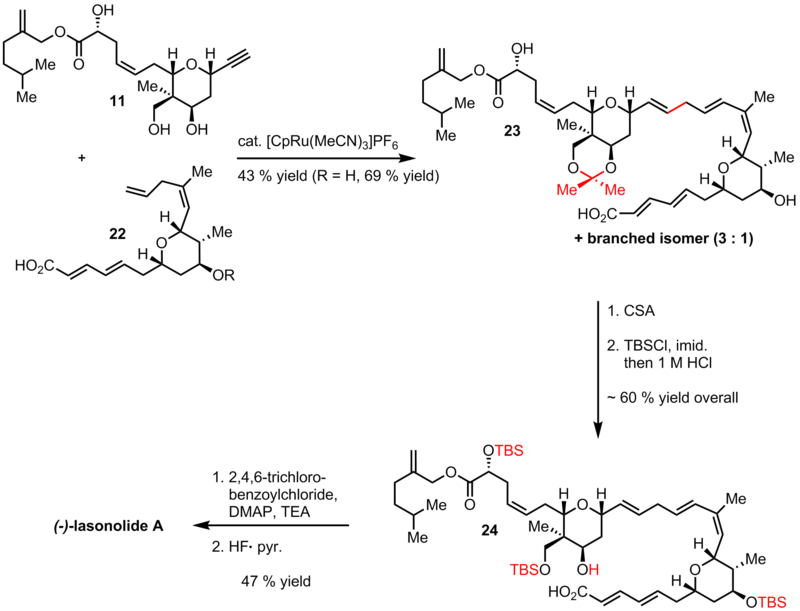 According to the paper the use of the trifluoroethyl ester was required in contrast to the normally employed ordinary alkyl esters. 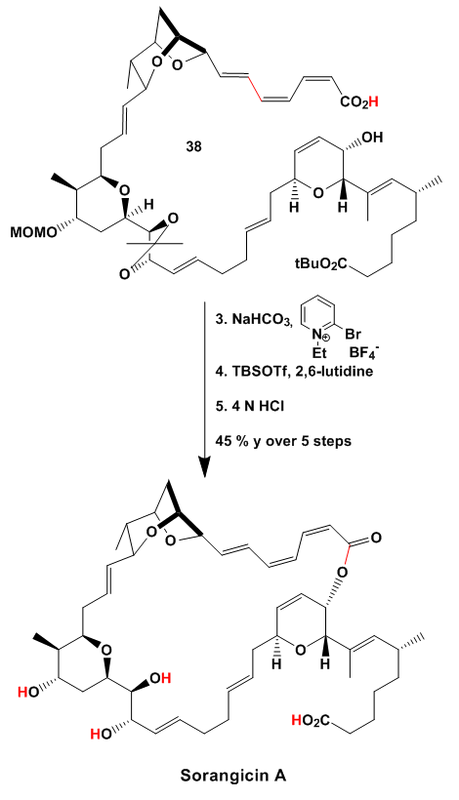 With fragment 5 in hand the group turned their attention onto the synthesis of alkylating agent 9. 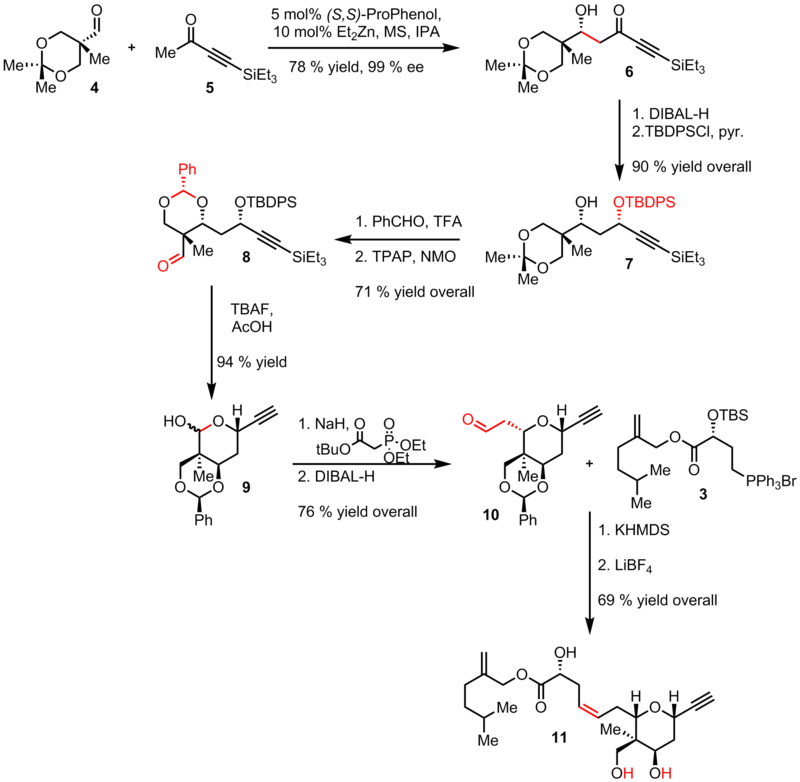 Pentenoic acid was reacted with pseudoephedrine, and alkylated under Myer’s conditions to give 8 in high yield and dr. Reductive removal of the auxiliary and Appel iodinaton then gave 9. 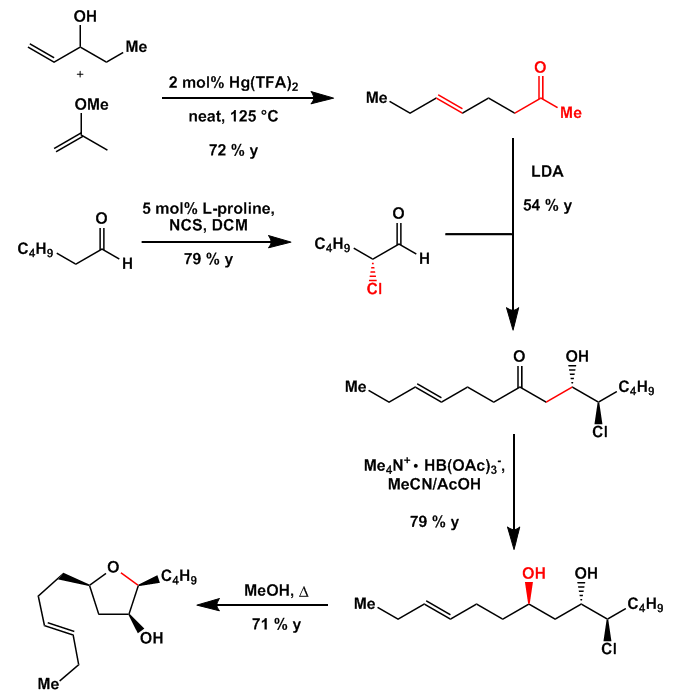 Both fragments were combined via enolization of 5 with LDA in the presence of HMPA followed by the addition of 9. 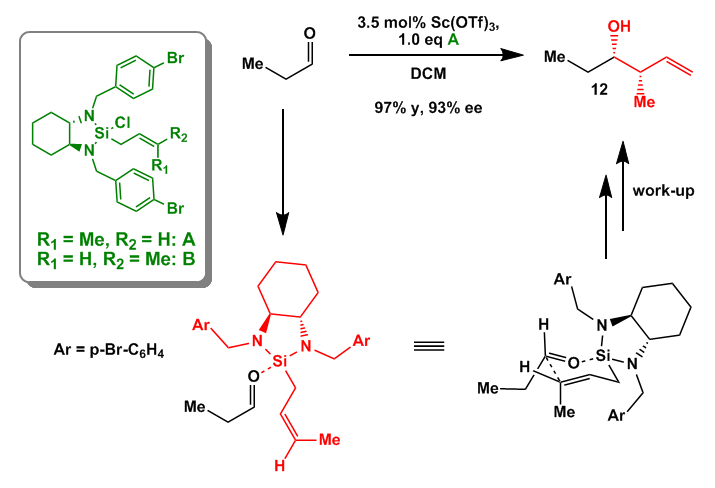 Next a double bond was introduced through selenation/selenoxide elimination. 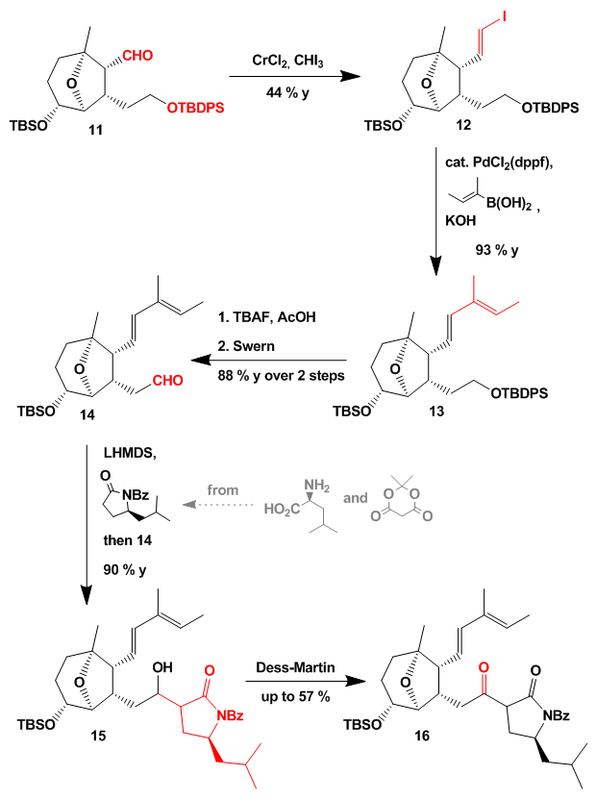 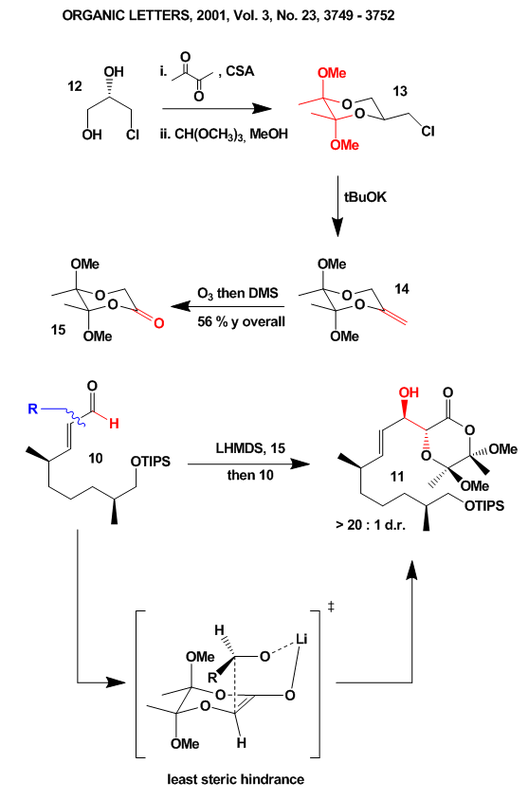 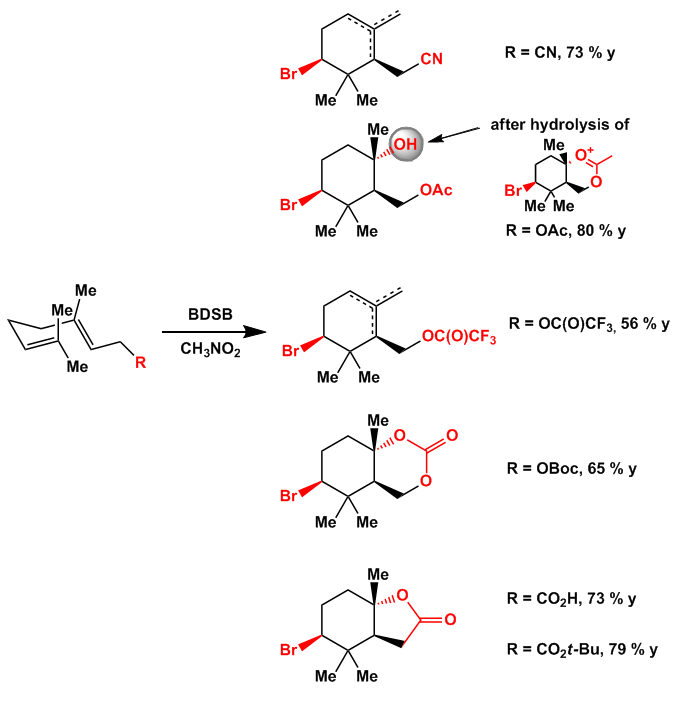 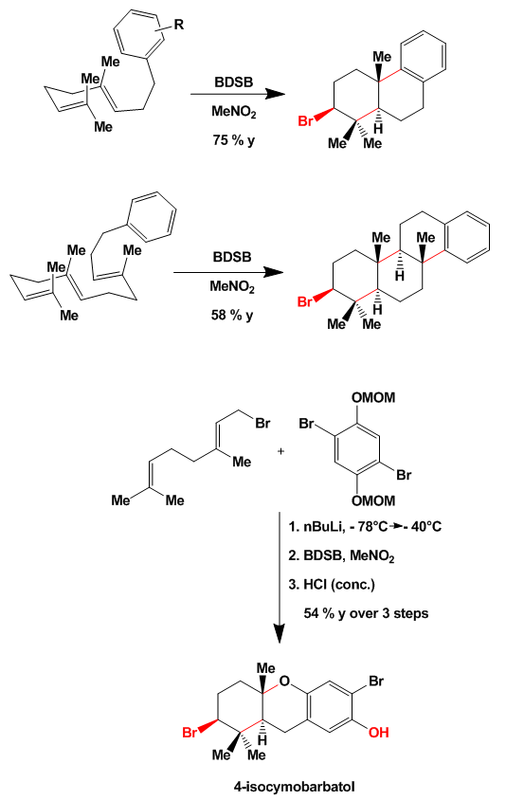 Global desilylation with H2SiF6 and Dess-Martin oxidation then gave bisaldehyde 11. 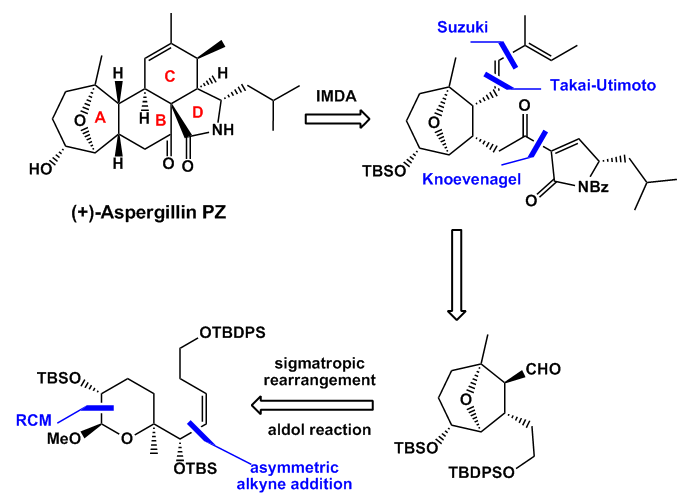 This cyclizes with some help from SmI2 (Kagan’s reagent) to give 12 in good yield. 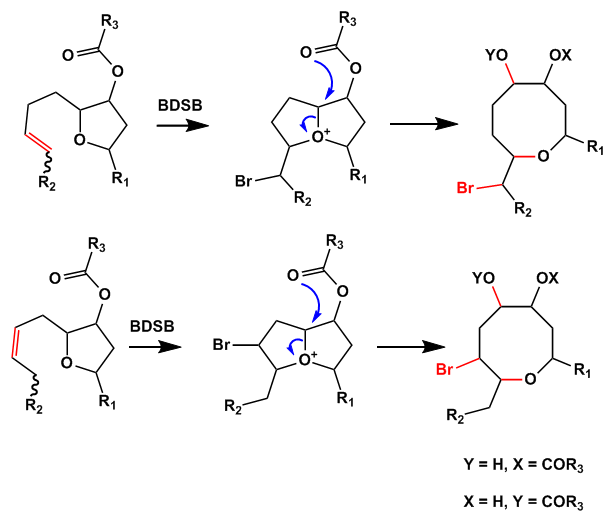 Remarkably during this process two new rings and four stereocenters were formed in a highly selective manner. 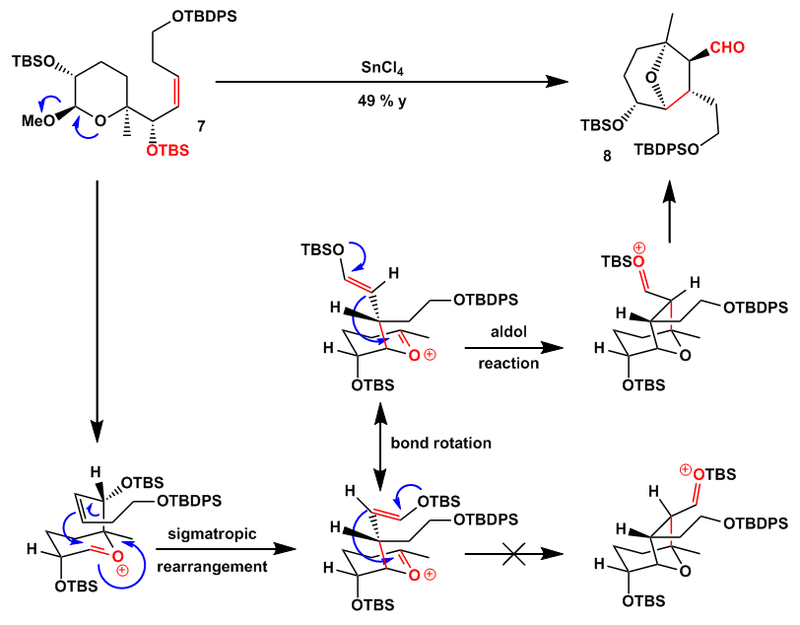 Again the mechanistic rationale is discussed later in this review. 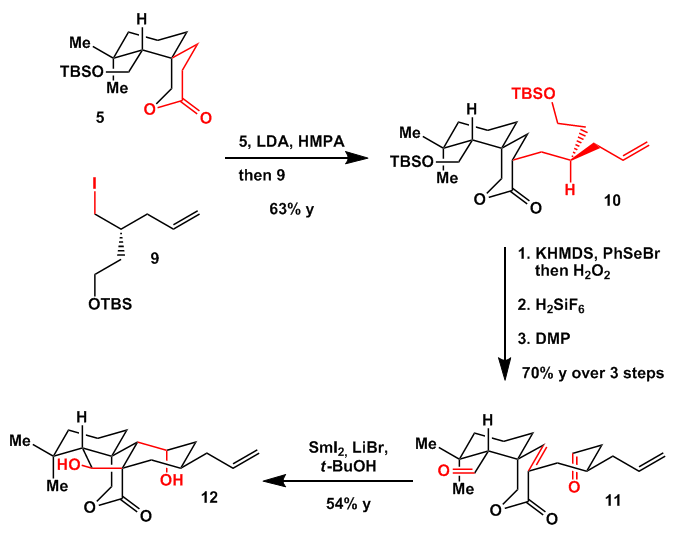 Protection of the free hydroxy groups with acetic anhydride catalyzed by TMSOTf furnished lactone 13. 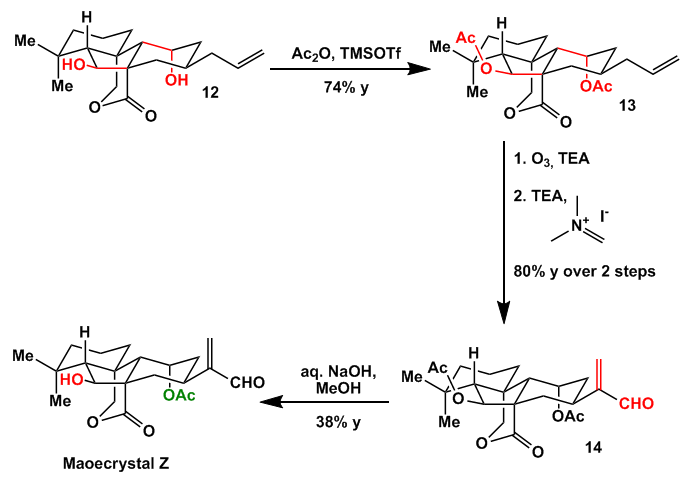 To the end ozonolysis of the terminal olefin, exo-methylene introduction with Eschenmoser’s salt and selective mono-deprotection produced Maoecrystal Z in moderate yield. 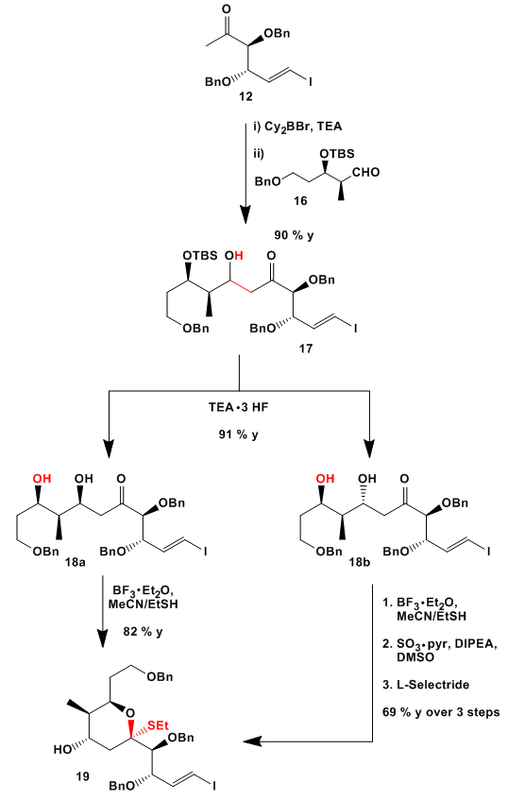 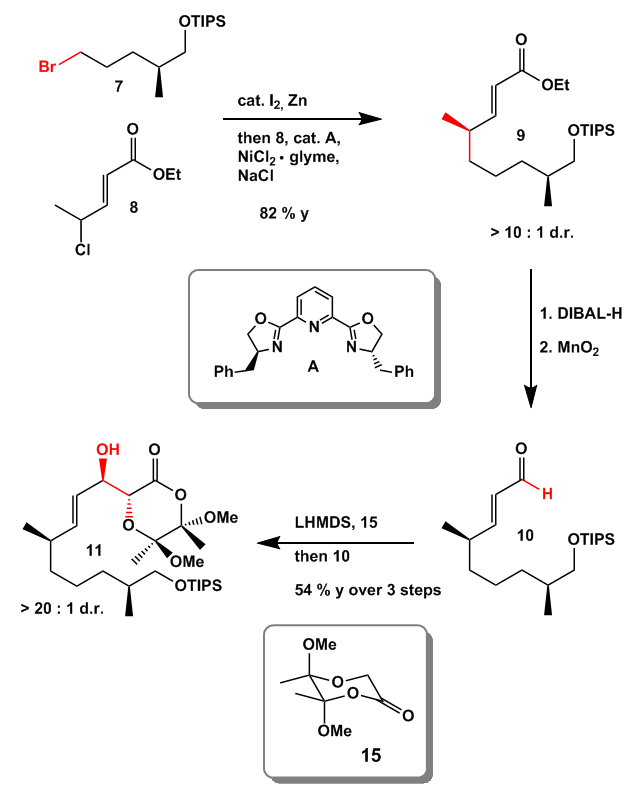 The major problem the end of the synthesis posed was the selective acetylation of 12. 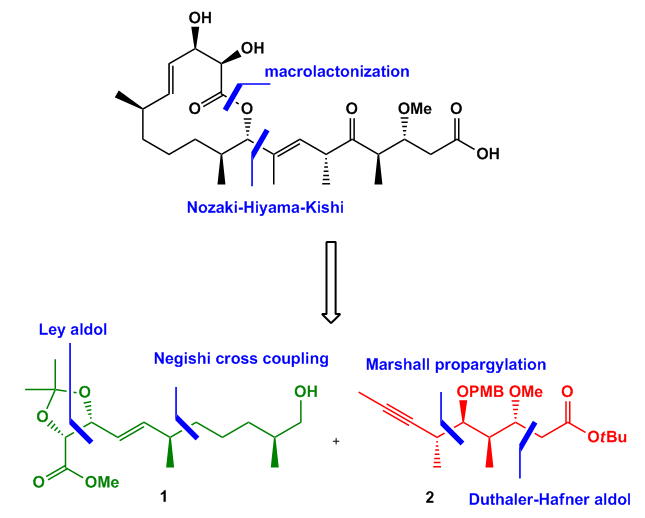 Acetylation was not possible under various conditions without rearrangement processes or different monoacetylation products. 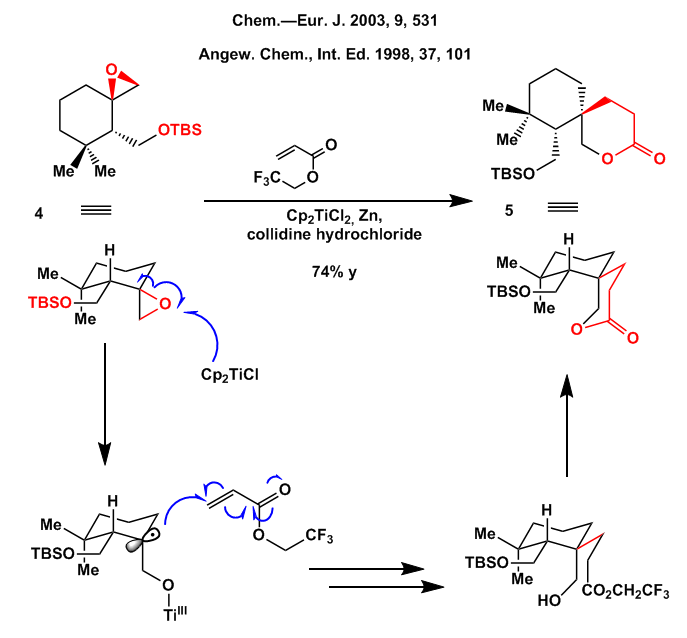 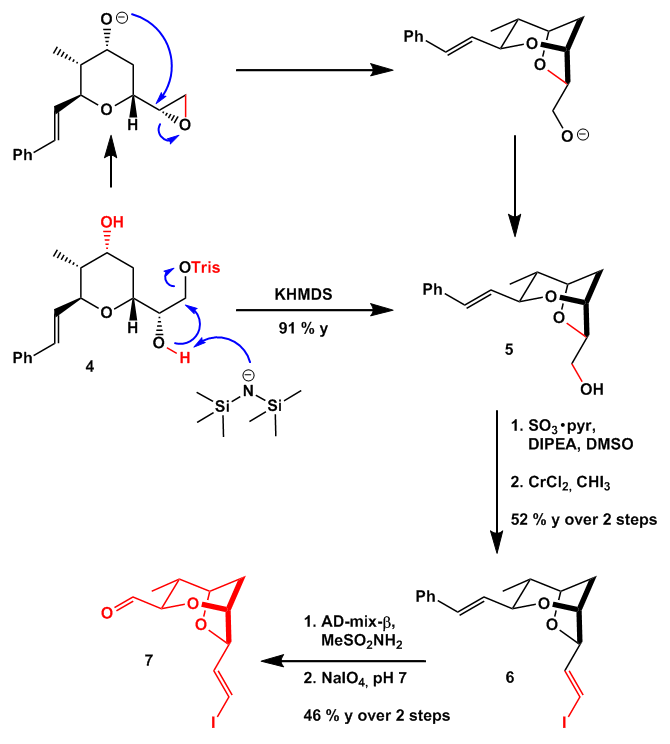 As promised here is the mechanistic understanding of the lactonization process: reductive opening of the epoxide gave a tertiary radical which attacks the acrylic acid ester. 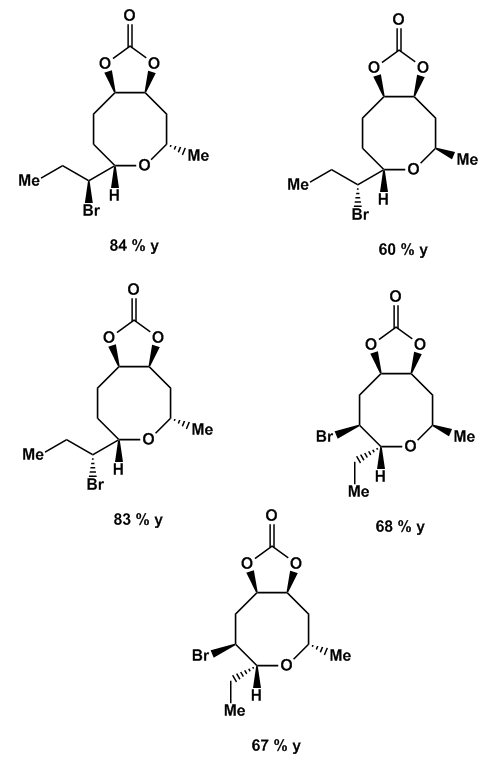 The resulting ester then cyclizes spontaneously under the reaction conditions. 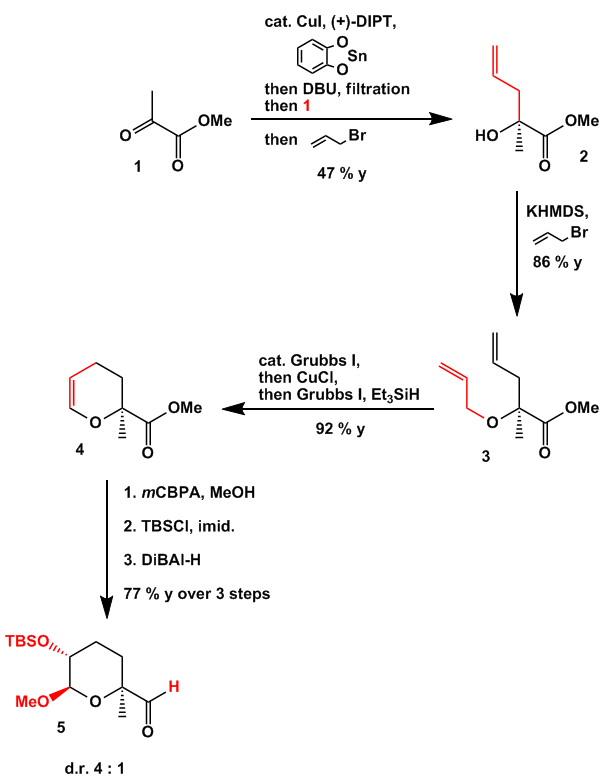 The latter cyclization of the bisaldehyde can be explained with the scheme shown below. 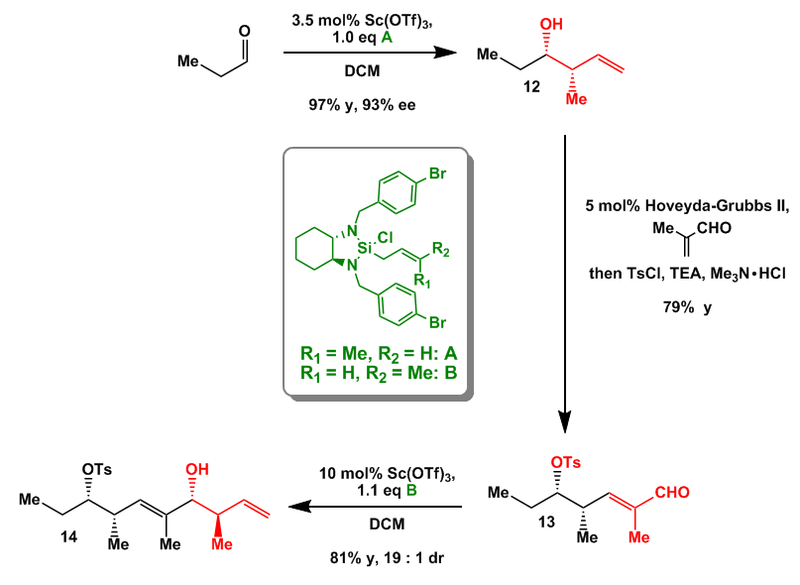 As usual SmI2 produces a ketyl radical from the less sterically hindered carbonyl functionality. 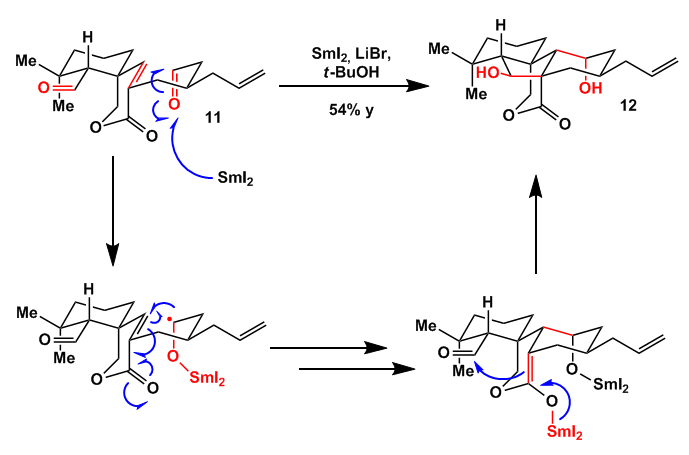 6-endo-trig cyclization closes the first ring and provides an enoyl radical which is reduced by a second equivalent of SmI2 to give the corresponding enolate. 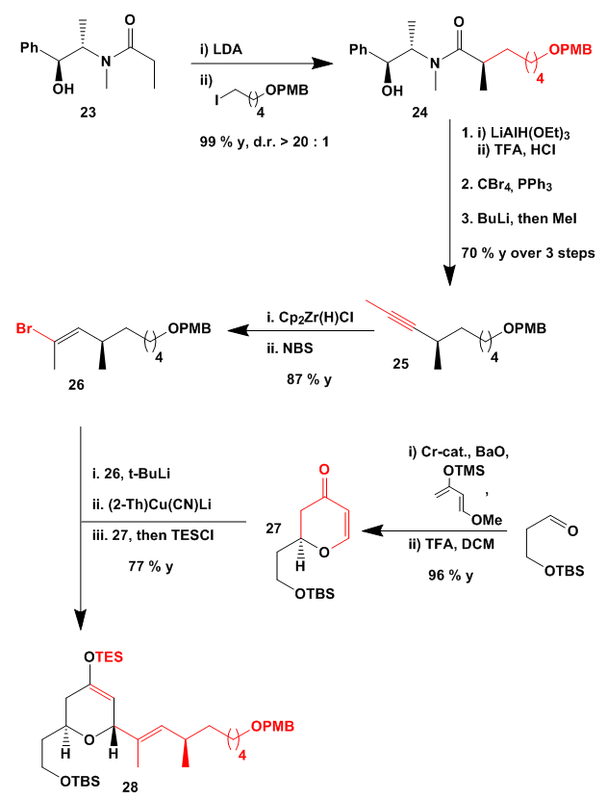 Aldol reaction with the remaining aldehyde closes the second ring to give 12. 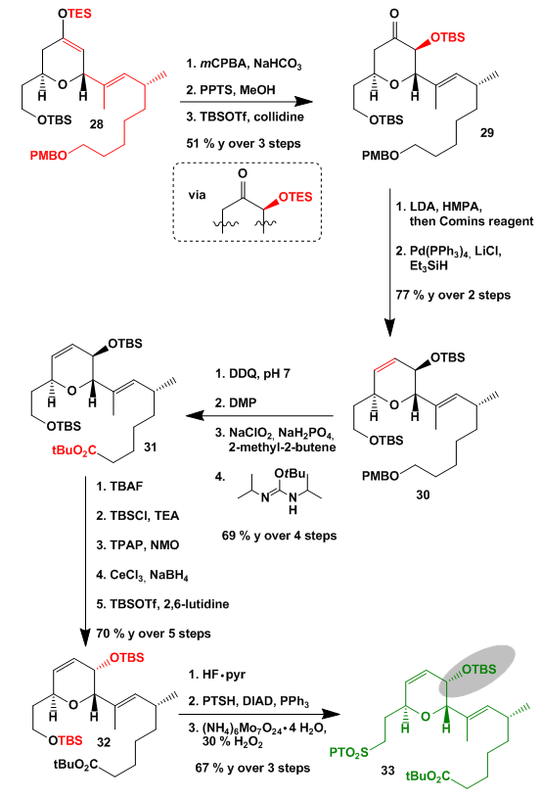 Very nice work… And very straightforward. 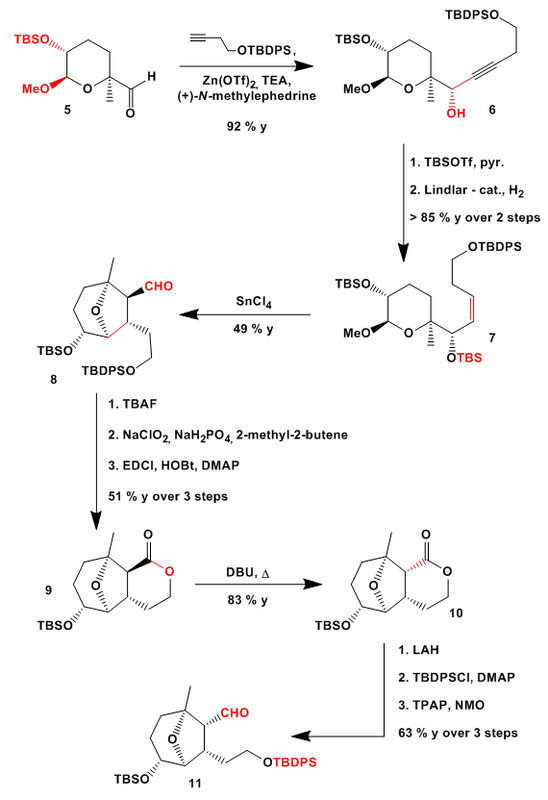 I really like the two key steps because of their efficiency and their rareness.